People who have been through a significant disease or traumatic injury can be left with some disability, which could be in the form of physical, psychological or even social impairment. At Apollo Clinic, we offer a structured, multi-disciplinary approach to help such individuals to return to normalcy including Rehabilitation services. Rehabilitation, as the name suggests, is the restoration of sensory and cognitive function. Rehabilitation typically involves methods to retrain the neural pathways or new neural pathways to regain or improve body functions impaired by injury or disease. Neurological Rehabilitation – This includes therapies to help individuals with a brain or spine injury or a stroke. Rehab helps patients to restore and improve health and physical function; regain mobility, reinstate balance and build strength; provide training to regain motor skills so as to allow them to resume daily activities. Orthopaedic Rehabilitation – People who have been through a joint replacement or sustained significant bone trauma such as knee/hip replacement, back pain, neck pain or multiple fractures can benefit from orthopaedic rehab. Cardiac Rehabilitation – Those who have been through a cardiac event or procedure such as stenting, bypass surgery, angioplasty or have Ischemic Cardiomyopathy or Arrhythmias can significantly benefit from cardiac rehab. Our programs help enhance cardiovascular function, reinstate and build your strength and improve exercise tolerance. Rheumatologic Rehabilitation – Rheumatologic rehab can greatly help people suffering from disorders such as rheumatoid arthritis, systematic sclerosis, ankylosing spondylitis, osteoarthritis, gout, fibromyalgia, joint and hip pain, issues of spasticity or osteoporosis. Rehab can help joint pain, stiffness and improve breathing capacity. Pulmonary Rehabilitation – If you or a loved one is suffering from chronic obstructive pulmonary disease, shortness of breath or respiratory impairments; you should consider pulmonary rehab. It helps improve exercise tolerance, independent functioning and decrease breathlessness. Sports Rehabilitation – Sports injuries such as overuse injuries, muscle tears, tendon and ligament problems, ankle and foot pain, stiffness can stop you from enjoying your favourite sport. Sports physiotherapy can significantly help in restoring and maintaining your physical strength, performance skills and levels of function. 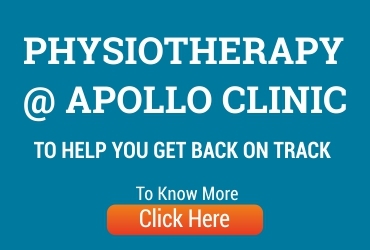 At Apollo Clinic, we are well equipped with all possible material and human resources to smoothly facilitate rehab physiotherapy, physical therapy and occupational therapy. At Apollo Clinic, we offer a holistic program consisting comprehensive initial assessment, customised healthcare packages, active family participation, reduced dependence on mobility aids. Our multi-disciplinary team of expert physiotherapists, occupational therapists and motivated personnel provide superior care to patients of all ages. We also offer outpatient rehabilitation to keep track of our patients’ life-long progress.